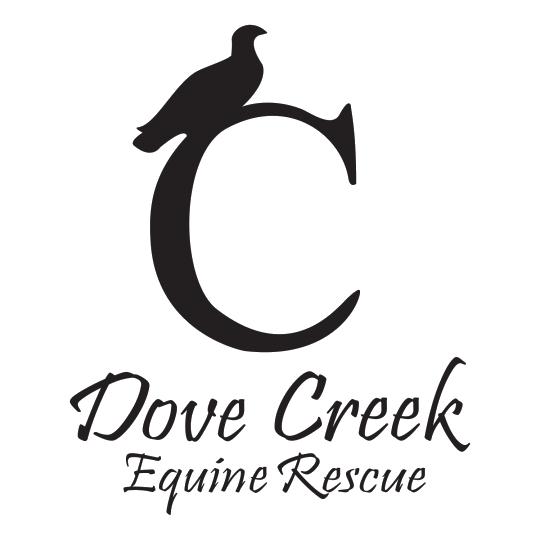 Dove Creek Equine Rescue is a 501(c)3 non- profit, dedicated to making a difference in the unwanted horse population. Our goal is to eventually place horses in homes that are fitting to both horses and owners. We honor and value the horse/human bond and through our programs we offer various opportunities to nurture that bond. Since our inception in September of 2012, we have re-homed 75 percent of the horses received while maintaining the other 25 percent that are not adoptable in our sancturary, thanks to the generosity of our supporters. Once horses are rehabilitated physically and mentally, those that will be rideable go into our training program with Frank Castillo and are given time in training to establish a good foundation and develop their own skills. By only rehoming horses that we feel have had time to fully rehabilitate we ensure a successful adoption. An average of 30 horses at Dove Creek enjoy a canyon sanctuary of 500 acres of grassy plains where they roam in a “herd” environment, setting the stage for the continued healing of their minds and bodies. In addition to the financial support we have received, it is this unparalleled environment and painstaking care provided by our staff and volunteer team that enable us to successfully rehabilitate and rehome these wonderful majestic creatures. By meeting the needs of the horse, we have found we are meeting a much deeper need in people - compassionate connection. Don’t have time for a short movie? We broke it into four parts. Part 3 "Horses Healing People"
Part 4 "Call to Action"
Laurie Higgins-Kerley founded the rescue in September of 2012. She was profoundly changed from time spent with a small herd of horses at Dove Creek who assisted her in healing from a grief stricken state after the loss of her husband in 2008. Laurie realized how much horses seem to know when a human is vulnerable and weakened as they showed her this by coming close, offering a deep connection, making her part of their herd. This was a salve for her broken heart and eventually her insight and reflection ignited a desire to assist them in "their world". Those that needed a second chance, some time to mend, and heal from the hand that life dealt them, which she had experienced and understood. Being with her small herd of horses was a place of connection that she now says is a gift of grief. It seemed Dove Creek was the perfect place for this to happen. It didn't take her long to gather support and form a board, file a non-profit certification, and get to work! Frank Castillo brings a life time of experience working with horses and cattle to his position as Foreman and Head Horse Trainer at Dove Creek Ranch and Equine Rescue since 2013. His horsemanship skills and knowledge have helped many of our rescues rehabilitate and go on to be adopted into safe and loving homes. We get the experience of watching him fearlessly work with a trembling horse for hours on end, his steady patience guiding the horse to a new way and a better life. Frank brings a tremendous amount of creativity to Dove Creek with his uncanny ability to partner with horses and lead them out of trauma, building trust and establishing a good foundation from which they can grow and evolve - in other words, giving them a second chance. Frank has a plethora of training skills he uses to coerce a horse back from being fearful around humans to being a skilled and reliable mount. Erika began at Dove Creek in August 2010 as a volunteer groomer for the horses at the ranch until the rescue was started in September 2012. She eagerly volunteered to be on our Board of Directors and moved quickly into managing the Volunteer Program. Erika has been a stalwart supporter of our cause with her fierce commitment to our mission. She has done an excellent job managing our organization administratively on a volunteer basis through the years and is exemplary in her compassionate action and love for all the animals that come through Dove Creek’s gates. Erika is always willing to offer her assistance to wherever needed - an aspect of character we greatly appreciate that has been an integral part of our success as an organization. Dove Creek Equine Rescue is lucky to have Erika on board as we go forward. Weston, Frank’s son, has been at Dove Creek as long as Frank and wears many hats. He is our medical technician for the injured and sick animals. His patience and gentleness with horses requiring daily medical treatment is greatly appreciated at the rescue because of the willingness it takes to doctor acute and chronic injuries, which are quite often at Dove Creek. The successful outcome of many a horse is in part due to Weston’s assistance in their rehabilitation process. Whether he is riding a new horse or repairing fence, Weston does the job with integrity and diligence. We are grateful to have this young man on our staff!